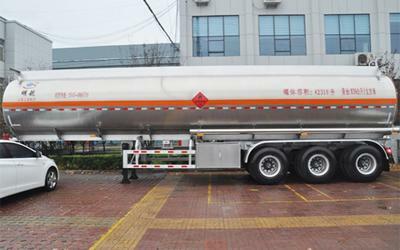 The 30--60 CBM aluminum alloy fuel tank trailer is designed for over the road transportation of various liquid fuels such as gasoline and diesel. When compared to ordinary steel tank trailers, the aluminum alloy fuel tank trailer features the same hauling capacity at a significantly lighter weight. The tank trailer is 4 to 6 tons lighter than the most common steel fuel tankers. The tank shell is constructed from aluminum which offers safety protection form static buildup which can cause dangerous explosions. The tank is lightweight, energy efficient, and can carry heavy loads. Sanxing has been manufacturing heavy duty vehicles and special vehicles since 1994. Besides the aluminum alloy fuel tank trailer, we offer a wide range of diesel fuel tank trailer, gasoline fuel tank trailer, stainless steel tank trailer, cargo semi-trailer and so on. From the raw material selection to manufacturing process, we have rich experience and offer high quality fuel tank semi-trailers and other special transport vehicles with custom solutions.